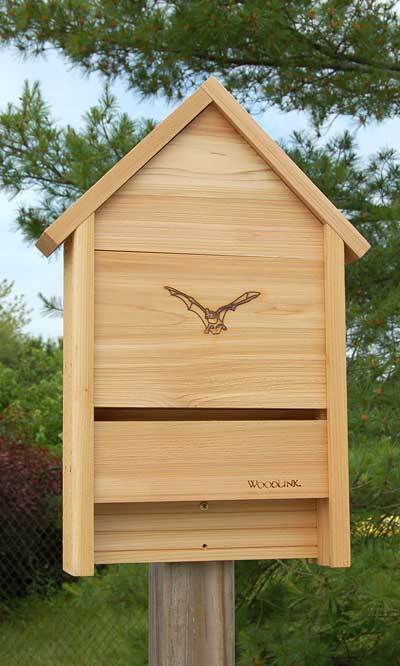 The Woodlink Bat Chalet features a single chamber that holds 25 bats. The interior surface and landing platform is made of rough wood and is grooved to make it easy for bats to cling when roosting and landing. The single chamber measures 7/8" deep. The 1/2" ventilation gap in the front of the house serves to maintain proper temperature and helps with air circulation. A 4.5" bat design is burnt into the front of the house. The roof is slanted for better rain run-off. This bat house weathers beautifully as it is made of kiln-dried inland red cedar and is assembled with zinc-plated screws. This house has pre-drilled holes and may be mounted using the included zinc-plated deck screws. Made in the USA.